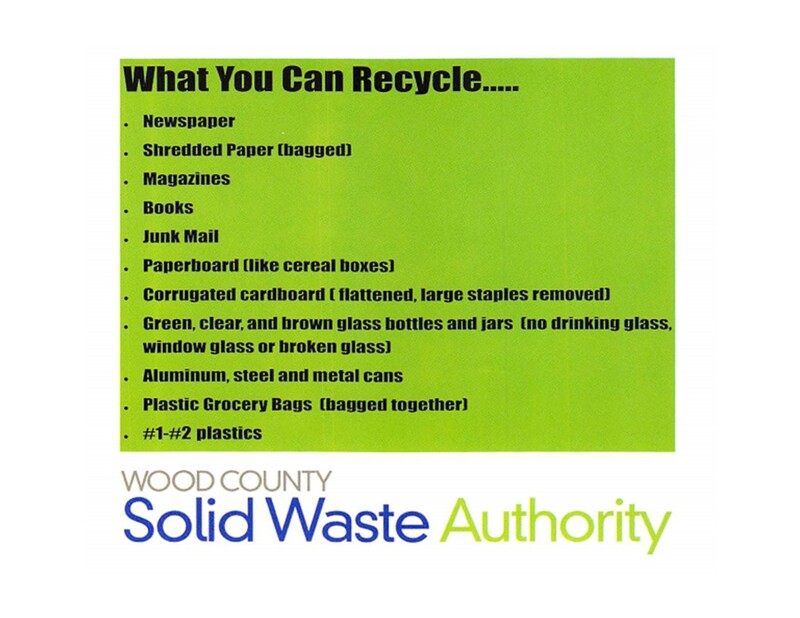 For over 30 years, the Wood County Solid Waste Authority has been charged with regulating our local landfill. Join us in our efforts to reduce landfill waste through recycling of most household waste or proper disposal of hazardous items. Leave plastics, glass, cans and paper in your curbside receptacle for weekly collection. Leave up to 8 tires annually curbside for pickup at no charge. After 8 tires in a year, a fee will be assessed. Residents can also bring tires to our periodic collection events. leave the can out in the hot sun to dry, then place it curbside for weekly pickup; please leave the lid off of the can. fill the can with kitty litter to absorb the paint, and then place it curbside for weekly pickup; please leave the lid off of the can. Call John Reed at (304)424-1873 for more information. Check out our Award Winning Video! Within City Limits of Parkersburg, please call (304)424-8597.